﻿C: Words followed by this are "common" words that are targeting grade-level spelling skills. CK: Words followed by this are vocabulary words derived from our Core Knowledge studies. G: Words below this are from a Greek root. Spelling words are preceded by the root in capital letters and the root's meaning in parenthesis. L: Words below this are from a Latin root. Spelling words are preceded by the root in capital letters and the root's meaning in parenthesis. Please note that words are followed by parts of speech and definitions. Scroll to the bottom of the page for a sample page of Vocabulary Homework. anagram noun "word or phrase made by rearranging letters"
aqueduct noun "tube or canal to transport water"
viaduct noun "bridge over a valley for cars or trains"
agile adjective "able to move quickly and easily"
coagulate verb "change from a fluid to a solid"
suspense noun "a state of being excited about what might happen"
hyperbole noun "an exaggerated statement"
hypochondria noun "an excessive worry about one's health"
hypoallergenic adjective "relatively little chance of causing allergic reaction"
subterranean adjective "beneath the earth"
rupture verb "to break or tear"
peace noun "lack of conflict"
pacifist noun "person who resists violence"
perspective noun "point of view"
speculate verb "to form a theory without evidence"
unequivocal adjective "without a doubt"
vocabulary noun "group of words in a language"
saline - adjective or noun "containing salt"
salinometer - noun "instrument that measures salt levels in water"
marine - adjective "of the sea"
maritime - adjective "connected with sea location or activity"
nautilus noun "a shelled sea creature"
nauseate verb "give an unsettled, sick stomach"
navigation noun "thedirection of your course"
circumnavigate verb "to go completely around something via water"
homonym noun "two words with same spelling but different meanings"
heterodox adjective "does not behave according to beliefs or expectations"
cardinal adjective or noun "essential; type of bird"
cardinal points noun "on a compass, N,S,E,W"
porthole noun "small opening in the side of a ship"
portcullis noun "vertically sliding castle door"
novelty- noun "new or original"
orderly- adjective "arranged, regular, obedient"
secule- noun "period of geologic time"
primary- adjective "firs in order, earliest, main"
primitive- adjective "conditions before technology"
second adjective "next after the first"
secondary adjective "after the first"
tertiary adjective "of the third order"
tertial adjective "a set of flight feathers on a bird's wing"
quartile noun "variables split into four groups"
quarter noun "one of four equal parts"
quintile noun "split into five groups"
quintuplicate verb "make five of something"
decimate verb "destroy one tenth of something"
decimeter noun "one tenth of a meter, about 4 inches"
electricity noun "a form of energy"
electron noun "a particle with a negative electric charge"
graduation noun "a ceremony for completion of a program"
centigrade noun "a scale of measuring temperature; Celsius"
surplus noun/adjective "extra, more than was needed"
nonplussed adjective "perplexed, not knowing what to say"
acropolis noun "the high point of a city"
acronym noun "word formed from the first letters of a phrase, like B.O.B." catastrophe noun "downturn of events"
cataclysm noun "violent upheaval or event, often natural"
​republic C - noun "state in which supreme power is held by the people and their elected representatives, and which has an elected or nominated president rather than a monarch"
​askance C - adverb "with an attitude or look of suspicion or disapproval"
agony - noun "extreme suffering"
antagonize - verb "cause hostility and anger"
envelope C - noun "container for mailing a letter"
circumstance C - noun "a condition that impacts something"
dromedary - noun "a one-humped racing camel"
insurmountable - adjective "too great to be overcome"
paramount - adjective "of crucial importance"
humiliate - verb "make someone ashamed publicly"
humility - noun "humbleness; modesty"
foliage - noun "plant leaves"
portfolio - noun "large case for storing papers; collection of work"
medicinal - adjective "relates to medicine"
Medicare - noun "government program providing medical insurance"
insane - adjective "crazy, mentally ill"
sanitarium - noun "place for treating ill or insane people"
emissary C - noun "diplomatic representative"
ambassador C - noun "representative of a country"
declarations C - noun "announcements"
tactics CK - noun "strategies"
strategy CK - noun "a plan of action"
assessment CK - noun "an evaluation of something"
tactical C - adjective "strategic"
support C - verb "to encourage or hold up"
democracy C - noun "system of government by the whole population"
federalism C - noun "a system of government in which entities such as states or provinces share power with a national government"
liberalism C - noun "considering personal liberty and freedom as essential"
constitutionalism C - noun "Government in which power is distributed and limited by a system of laws that the rulers must obey"
inventory C - noun "amount of stuff in storage"
political CK - adjective "to do with politics"
mercenary CK - noun "soldier for hire"
coup d'etat CK - noun "an illegal seizure of government control (overthrowing the government to make your own)"
dossier C - noun "a collection of documents"
campaign C - noun/verb "a political or military operation"
diplomacy C - noun "dealing with people or situations delicately"
weaponize CK - verb "turn into a weapon"
rhinoceros - noun "large, heavy mammal"
rhinoplasty - noun "plastic surgery performed on the nose"
hologram - noun "3-d image made of lights"
holocaust - noun "destruction on massive scale"
cornucopia - noun "a symbol of plenty; a horn overflowing with goods"
cornea - noun "transparent layer covering the eye"
epidermis - noun "outer layer of cells, such as the skin"
dermatologist - noun "doctor who treats skin issues"
cuticle - noun "outer layer of living tissue"
cutaneous - adjective "relating to the skin"
cordial - adjective "warm and friendly"
encourage - verb "give support or hope"
endorsement - noun "act of giving public approval"
dorsicumbent - adjective/adverb "lying upon the back"
athlete - noun "a person skilled in sports"
pentathlon - noun "competition with five events"
shepherd C - noun "person who tends sheep"
exhaust C - verb or noun "to use up energy OR waste gas from a machine"
herb C - noun "plant used for flavor or medicine"
enlightenment CK - noun "being enlightened"
allude - verb "suggest or hint"
psychiatrist - noun "doctor of the mind"
geriatrics - noun "branch of medicine relating to older people"
lilies C - noun "plural of lily"
liquor C - noun "alcoholic drink"
medal C - noun "a metal, circular award"
discovery CK - noun "a finding"
dialogue CK - noun "conversation"
demystified CK - verb "made clearer"
philosophical CK - adjective "to do with the study of knowledge"
romanticism CK - noun "art and literature about imagination and emotion"
discoveries C - noun "findings"
electricity C - noun "a form of energy"
exquisite C - adjective "extremely lovely"
virile - adjective "manly strength and energy"
virtue - noun "high moral standards"
virtual - adjective "accessed or stored on computer"
feminine - adjective "with female quality"
feminism - noun "advocacy of women's rights"
femme fatale - noun "attractive and deadly woman"
infant - noun "a very young child"
infanticipate- verb "awaiting the birth of a child"
pediatrician -noun "doctor of children"
pedagogy - noun "teaching method"
pedantic - adjective "overly detailed"
scholastic - adjective "concerning schools"
scholar - noun "specialist in a specific area of study"
scholarship - noun "award money supporting education"
Zeus CK - noun "king of the Greek Gods"
Vieira CK - noun "Portuguese surname"
venture CK - noun "risky or daring journey"
adventure CK - noun "an unusual or exciting experience"
gallivant CK - verb "to jaunt about"
​flabbergasted CK - verb "to be surprised or dumbfounded"
eulogy - noun "speech for deceased person"
euphemism - noun "indirect expression"
euphoria - noun "good feeling"
malediction - noun "a curse"
malapropism - noun "mistaken use of a word"
evacuate - verb "to withdraw"
elaborate - verb or adjective "to work in detail"
archaeology - noun "study of human history"
archaic - adjective "very old"
oligarchy - noun "rule by few"
arc - noun "part of a circle"
archer - noun "person who shoots arrows from bows"
archway - noun "passage under an arch"
bicycle - noun "two-wheeled vehicle"
motorcycle - noun "two-wheeled motor vehicle"
Cyclops - noun "round-eyed monster"
demagogue - noun "political leader who gets support by appealing to prejudice and fear instead of rational argument"
xenophobia - noun "intense dislike or fear of people from different cultures"
misogynist - noun "a person who is strongly prejudiced against women"
nativism- noun :policy of protecting the interests of locals over those of immigrants"
bigot- noun "a person who is intolerant of those with different opinions"
predator- noun "a person who ruthlessly exploits others"
election- noun "an organized process of selecting representatives to government"
president- noun "the elected head of state"
college- noun "an organized group of professionals"
reconcile- verb "to return to friendly relations"
differences- noun "ways in which people are not the same"
circle -noun "a round shape"
circumference - noun "distance around a circle"
circulation - noun "movement around something"
perimeter - noun "sum of the sides of a shape"
perigee - noun "point where the moon is nearest earth"
perihelion - noun "point in orbit when object is nearest the sun"
theology - noun "study of religion/god"
monotheism - noun "belief in only one god"
theocracy - noun "government ruled by religion/god"
deity - noun "a god"
deist - noun "person that believes in a god but not in religion"
deus ex machina - noun "unexpected salvation by powerful being"
divine - adjective "of god"
diviner - noun "person who predicts events"
diva - noun "famous female singer"
homo sapiens - noun "human species"
humane - adjective "having compassion"
ad hominem - adjective or adverb "directed at an individual"
commence C - verb "to begin"
complete C - adjective or verb "having everything required; finished"
deceive C - verb "trick or lie"
anthropology - noun "study of humankind"
anthropomorphize - verb "to make human-like"
​misanthrope - noun "person who dislikes humankind"
hippodrome - noun "race course for horses"
hippopotamus - noun "a water dwelling mammal"
hippology - noun -"the study of horses"
porcupine - noun "a mammal with long quills"
porpoise - noun "a small, toothed whale"
architecture CK - noun "the art of making buildings"
philosophy CK - noun "the study of knowledge"
wisdom CK - noun "a soundness of judgement"
emotion CK - noun "a feeling"
rhetoric CK - noun "the art of persuasive speaking"
reality CK - noun "things as they actually exist"
ornithology -noun "the study of birds"
ornithivorous - adjective "eats birds"
ornithopter - noun "a flapping, flying machine"
aviary - noun "a large cage for birds"
aviculture- noun "the raising and caring of wild birds"
aviator - noun "a person who pilots aircraft"
allegory CK - noun "a story with a hidden meaning"
culture CK - noun "a collection of values and experiences"
classical CK - adjective "relating to ancient Greek and Roman culture"
hypothesis CK - noun "an educated assumption or explanation"
investigation CK - noun "a formal inquiry"
conclusion CK - noun "a judgement reached through reasoning"
amphitheater CK - noun "an outdoor theater"
Trojan CK - noun or adjective "from Troy"
ancient CK - adjective "really old"
Socratic CK - adjective "related to Socrates"
contribution CK - noun "a gift or payment"
desertification CK - noun "becoming desert"
gregarious - adjective "likes company"
egregious - adjective "really bad"
segregate - verb "to separate"
omnivorous - adjective "eats plants and animals"
omniscient - adjective "knows all"
omnipotent - adjective "all powerful"
amphibian - noun "frogs, newts, etc." amphora - noun "jug with two handles"
amphigory - noun "a nonsense verse"
ambidextrous - adjective "uses both hands"
ambiance - noun "mood of a place"
ambiguous - adjective "more than one meaning"
canine - noun/adjective "a dog"
caninity - noun "a canine quality"
Canidae - noun "a member of the dog family, such as wolves"
feline - noun/adjective "a cat"
felinophobia - noun "the fear of cats"
Felidae - noun "a member of the cat family, such as lions"
lion - noun "a large cat found in Africa"
dandelion - noun "a yellow-flowered weed"
chameleon - noun "a lizard species"
Greek CK - noun/adjective "from Greece"
mythology CK - noun "a collection of myths"
odyssey CK - noun "an epic journey"
equine - noun/adjective "a horse; related to horses"
equestrian - noun/adjective "related to horse riding"
Equidae- noun "a member of the horse family, such as zebras"
cavalry - noun "horseback soldiers"
chivalry - noun "a knightly moral code"
cavalcade - noun "a formal procession on horseback or vehicles"
Every page of Vocabulary homework begins with the correct heading. Each word should be practiced 4 times: twice on the front, twice on the back. note the paper is folded in half to create columns for practicing the words. 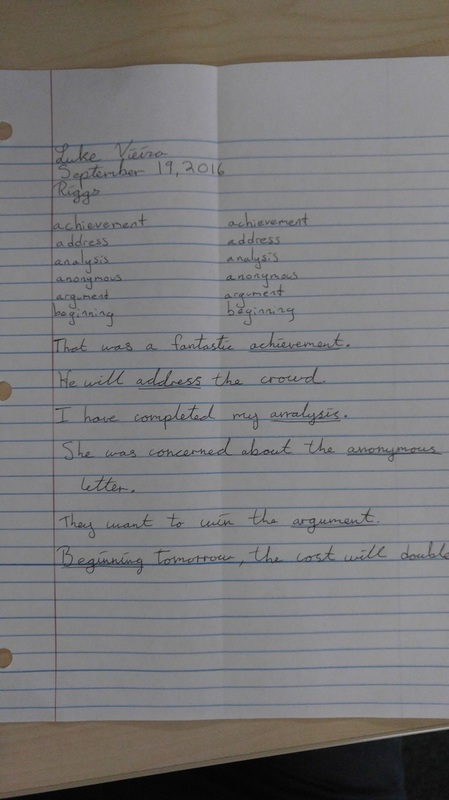 The bottom half of the page is for creating one sentence using each word. The target vocabulary word should be underlined.